California’s Proposition 37, a ballot initiative that would require the labeling of genetically modified foods, is coming down to the wire as the Nov. 6 election approaches. (I’ve written about Prop. 37 here, here, and here.) 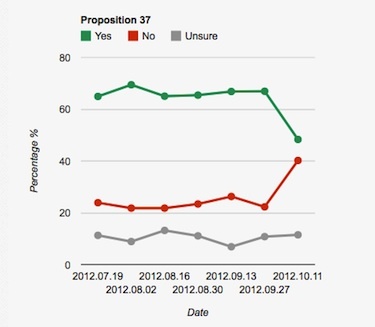 As recently as Sept. 27, Pepperdine University’s bi-monthly poll found 3-to-1 support among the state’s voters for the proposition. Two weeks later, the lead had shrunk to 48 percent for to 40 percent against. Like the presidential race, the fight over Prop. 37 has tightened dramatically. On Wednesday’s Democracy Now show, Amy Goodman hosted a no-holds-barred debate between Prop. 37 spokesperson Stacy Malkan and David Zilberman, professor of agricultural and resource economics at University of California, Berkeley, who opposes the measure. In the debate, Zilberman strains to convince viewers that labeling GMOs in California would mean the starvation of thousands in Africa. In another segment, Pollan holds forth on the food movement’s burgeoning political power, agruing that the movement remains in its infancy—he argues that the food movement today is like the environmental movement before the first Earth Day in 1970. Finally, for one more blast of Prop. 37 commentary as the election hits the stretch run, The New York Times’ food guru Mark Bittman recently made the case for it. Is Team Organic Outspending Team Big Ag in the GMO Labeling Fight?